Seizures of the deadly chemical carfentanil have exploded across the United States, with more than 400 cases documented in eight states since July alone, The Associated Press has found. Asked for comment, most denied they'd ever made the offers. Jilin Tely Import and Export Co. initially boasted in an email that carfentanil was one of its "hot sales product." After being named in AP's story, the company's website vanished and it denied ever producing carfentanil. "It's a loophole that needs to be closed because even small quantities can have a terrible lethal effect," said Andrew Weber, who served as U.S. assistant secretary of defense for nuclear, chemical and biological defense programs from 2009 to 2014. "Terrorists could acquire it commercially as we have seen drug dealers doing." Some 5,000 times stronger than heroin - and 100 times stronger than fentanyl itself - carfentanil is so toxic that an amount smaller than a poppy seed can kill a person. It was researched for years as a chemical weapon and used by Russian forces to incapacitate Chechen separatists in 2002. The AP did not buy carfentanil from the vendors and did not test whether the products on offer were genuine. DEA and State Department officials have discussed carfentanil's dangers with Chinese authorities, who have already controlled 19 fentanyl-related compounds, and urged them to blacklist it. But China has yet to act. The DEA says the carfentanil spreading through illicit drug markets in the U.S. is not being diverted from legal domestic supplies. "The carfentanil that has been seized in multiple U.S. states is believed to be arriving from foreign sources via illicit networks," Russell Baer, a DEA special agent in Washington, said by email. China's Ministry of Public Security did not respond to requests for comment. Since July, when carfentanil was first identified in the U.S. drug supply, the DEA has confirmed at least 407 carfentanil seizures in eight states, according to data obtained by the AP that did not include details on quantities seized. Dealers cut carfentanil and other synthetic opioids into illicit drugs like heroin, cocaine and fake prescription pills to boost profit margins. The main geographic cluster centers on Ohio, which has been hardest hit, with 343 confirmed carfentanil seizures. The drug has also spread through the surrounding states of Kentucky, Indiana, Michigan and Illinois. Carfentanil has been seized at least 34 times in Florida, the second-hardest hit state, and has been identified in Georgia and Rhode Island. DEA is waiting on confirmation from cases in West Virginia, New York and Pennsylvania. The resulting wave of human misery has been overwhelming. In just 21 days in July, paramedics in Akron, Ohio, logged 236 overdoses, including 14 fatalities, with suspected links to carfentanil, according to the DEA. In the first six months of this year, in contrast, they dealt with a total of 320 overdoses of all kinds. In September, the Ohio coroner's office confirmed eight carfentanil overdose deaths in Cincinnati, the DEA said. The Summit County Medical Examiner's Office revealed 73 deaths have tested positive for carfentanil since July. Lt. David Garro, head of the Akron Narcotics unit, said officers are slowly but surely making progress attacking the carfentanil problem. Three pounds of the drugs have been taken off the streets and there are open investigations on those suspected of buying the drug from China on-line. "I think somebody here in Akron, a group of maybe a dozen people or so, found out you could get on-line on the internet and order this stuff and have it shipped right to your house," Garro said. The true scope of the problem is likely bigger. The seizure data from the DEA only reflects samples confirmed as carfentanil by federal, state and local forensic laboratories. Some local authorities may not have tested specifically for the drug - not all labs even have the capacity to do so - and toxicology tests can lag for months as coroners struggle with a backlog of autopsies, according to the DEA. Direct exports of fentanyl-related chemicals from China arrive in the United States as air cargo or postal shipments, but are difficult to identify, according to congressional testimony obtained by the AP. "Standard field kits do not accurately detect fentanyl," U.S. Customs and Border Protection Commissioner R. Gil Kerlikowske said in answers to committee questions. He added that information from Chinese authorities on shipments destined for the U.S. could help customs more effectively intercept illicit packages. For now, vendors appear brazenly confident about their ability to evade customs. Some even guaranteed delivery. Shanxi Jinwei Technology Co. offered carfentanil and other drugs for export to the U.S. and Europe. "Please don't worry," the company said in an email. They added that they'd hide everything in aluminum bags and reship packages that failed to arrive. The company didn't respond to requests for comment. Carfentanil vendors also take advantage of loose oversight on major trading platforms like South Korea's EC21.com and China's LookChem.com marketplaces. EC21 claims to host 3 million products. Among them are carfentanil, heroin, cocaine, methamphetamine and ketamine, the AP found. A spokesperson for EC21 who refused to give a name said the site screened more than 700 keywords. "Every day we spend lots of time and effort to block" illegal products, EC21 said by Skype chat. But companies evade those keyword controls with the lightest touch of subterfuge. Like misspelling. A search for "fentanyl" yielded zero results. But "fentanyl" yielded 806 products from 422 suppliers on EC21. A search for "cocainee" tapped 35 suppliers and "heroinn" produced 21 suppliers. One company, Apex Special Chemical Medicine Trade Co., whose listed address was in Guangzhou, China, pulled its listings for carfentanil and other products from EC21 after being contacted by the AP. But at least six companies linked by email address or phone number to Apex appeared on the site this year, most of them in October. These new companies posted U.S. addresses - except one - and offered a cornucopia of illicit drugs. Emails requesting comment received no reply. Listed phone numbers did not work. LookChem, a chemicals trading platform headquartered in Hangzhou, China, screens its product listings once or twice a year, based on Chinese regulations, according to company spokesman James Li. "We audit every product from vendors, a human audit," he said. "It is not like people can sell anything they want." Yet the AP found four audit-approved vendors offering illicit sales of substances on LookChem. 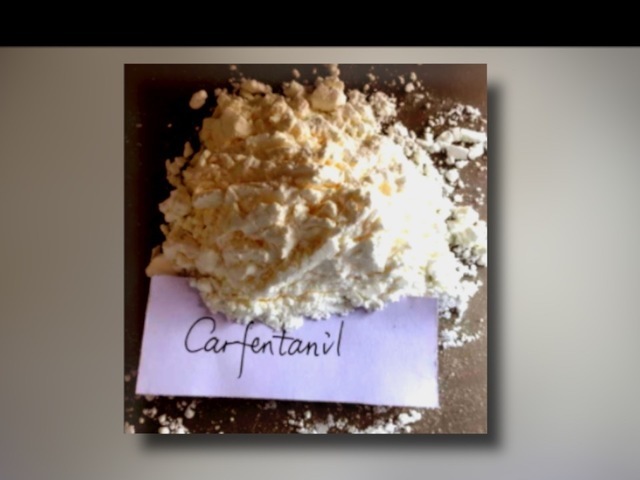 One is Shiyan Furuiyang Biological Technology Co., which offered by email to export carfentanil and fentanyl to the U.S. Fentanyl is a controlled substance in China. Search for it on LookChem's site and nothing comes up, but Shiyan Furuiyang simply printed "fentanyl" in red letters across multiple photographs of baggies plump with crystalline powder. "Fentanyl has a big market in USA," a Shiyan Furuiyang sales manager who called herself Susie said in a Skype chat. "We sent there before." Contacted later on Skype, another saleswoman, who advertised fentanyl on her profile, told the AP, "No comment, no explanation." All this just describes sales on the open internet. The darknet, a collection of shadowy websites invisible to most internet users, is also a vibrant marketplace for drugs. One darknet search engine yielded 118 listings of carfentanil for sale. China's actions can have a profound impact on global narcotics markets. After Beijing controlled 116 new synthetic drugs last October, U.S. seizures of key narcotics plunged, DEA data show. The reverberations of that law can still be felt. A sales manager named Eric from Shanghai Golden Time Biological Technology Co. refused to produce fentanyl and acetylfentanyl, both of which are controlled substances in China. "I can't make it," he said. But he was happy to export the far more potent, unregulated carfentanil for $8,000 a kilogram.